Interested purchasing an aquarium but want to get an idea as to how it will look? 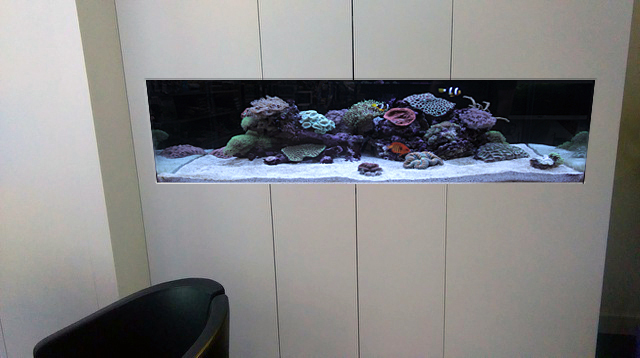 Ocean Life Aquatics now provide an aquarium design mock up service. Here’s one produced for a client who requested to upgrade the size of their current built in wall aquarium. Mock ups are a great first step to provide an idea as to what a finished fish tank design will look like. We are able to supply mock up photos or diagrams with dimensions if required and even too scale. Depending upon the projects theme, we can produce the mock up with vast array of different fish, eg, tropical plant theme, rocky aqua-scape or coral reef theme etc. 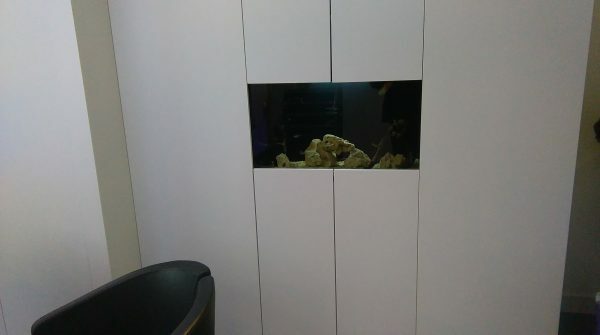 If your aquarium is sitting on a cabinet or being built into a wall? We are able to supply several mock ups each with different coloured or wood effect panels. This gives our clients the chance to try out different finishes to see which suits best. We have a vast selection of different finishes for aquariums using panels to clad the aquarium and cover access points, moreover, we are even able to edit your mock up to show different numbers and sizes of doors. A basic mock up starts at £75. The price may rise depending upon the amount of work that’s involved, however, a quotation is provided before any works are commenced. The top photo was taken by the client. With the information they provided, we produced the below image showing a new larger aquarium design. Please contact us for more information on our aquarium design mock up service.